They say gadgets get better with each year. Whilst it is true that the phone in your pocket now has more processing power than your first desktop computer and it is now possible to put a projector in your pocket, rather than in a flight case, I think there are some things where they got it right first time round. I collect old-school music technology – solid pieces of kit including a Sony reel-to-reel player, a 1930s valve radio and a portable gramophone from the 1920s. There are two reasons why I love these machines: the way they look and the sound they make. 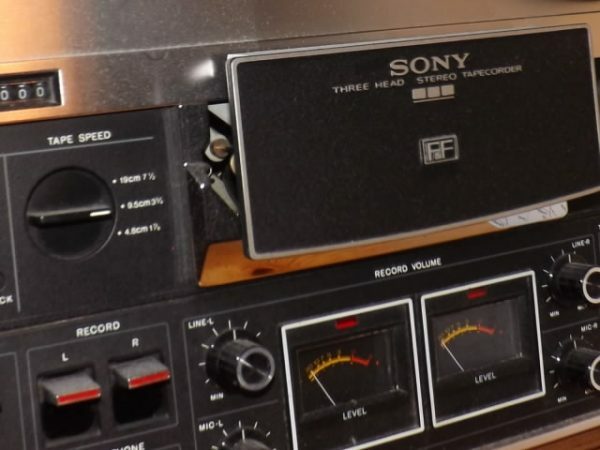 The Sony TC-377 is as much an ornament as it is a machine. It really doesn’t matter that the reel-to-reel player is bigger than a full modern hi-fi system; it’s an ornament as well as a music machine. Just as mp3 players compete to be the most stylish device to be hidden away in your pocket, reel-to-reel players boasted impressive aesthetics. The difference being you didn’t hide a reel-to-reel player – you displayed it. 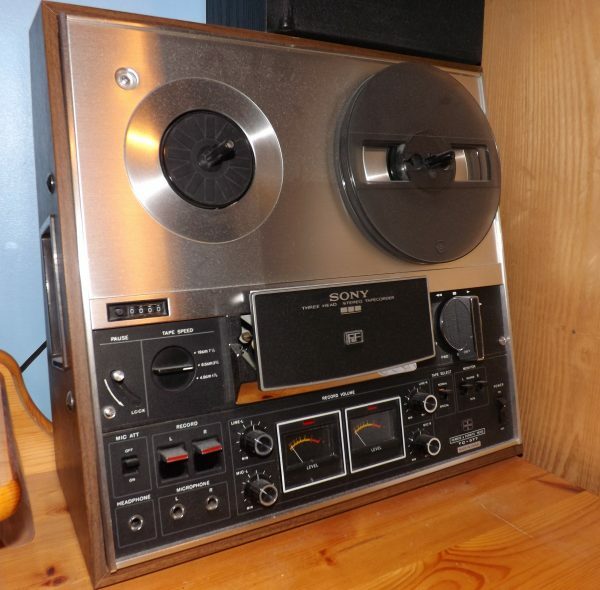 The model I own is the Sony TC-377, released in November 1971. 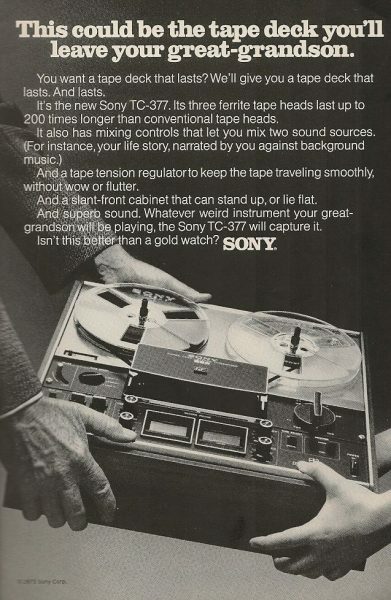 At the time, Sony suggested this ‘could be the tape deck you’ll leave your great-grandson’. Well, the original owner of my one failed in this mission as I was lucky enough to whisk it away from a car boot sale for just £5 (along with a large bundle of old cine film equipment)! However, I reckon that the TC-377 has only seen a maximum of two generations so far so there’s still a fair few years before it lives up to its maker’s suggestion! The TC-377 is one of the neatest tape decks of its kind. The deck, which won a Japanese Good Design Award, is able to operate both vertically and horizontally. The slight gradient of the operating face means that it is easy to make use of all of the machine’s features in both positions. I keep mine upright as it sits on my desk and therefore I don’t want it taking up too much desk space. Not only does the TC-377 allow for a high quality aural experience, it also acts as its own recording station. The deck features three Ferrite & Ferrite (F&F) heads which are notably more durable than standard tape heads and includes easy-to-use mixing controls which allow the user to record their own voice or music, or tape sound from another source – such as a vinyl player or radio. Of course nowadays I could create an anachronistic collection of Arctic Monkeys or McFly cassettes by recording songs from my mp3 player! The TC-377 actually has two recording channels – though I have never used both at the same time – which would allow the user to record voice and music from two separate sources together.